Thank you for participating in the FCFL pre-sale. If you have been following the crypto and ICO markets for the last 6 months you already know that the regulatory environment has been rapidly changing. The SEC has provided multiple comments regarding security and utility tokens, but has not provided formal guidance or a compliant framework on how to conduct these offerings. During this time, your investment was not distributed to the company. This was done to ensure that MicroVentures navigated through the regulatory climate prior to finalizing the offering. While we believe the initial path taken was compliant, we have decided the best way to ensure compliance is to unwind the investment opportunity and return investor capital. We are beginning the return process today.You may hear from someone on our team if we need to verify return instructions on how to return your investment capital to you. 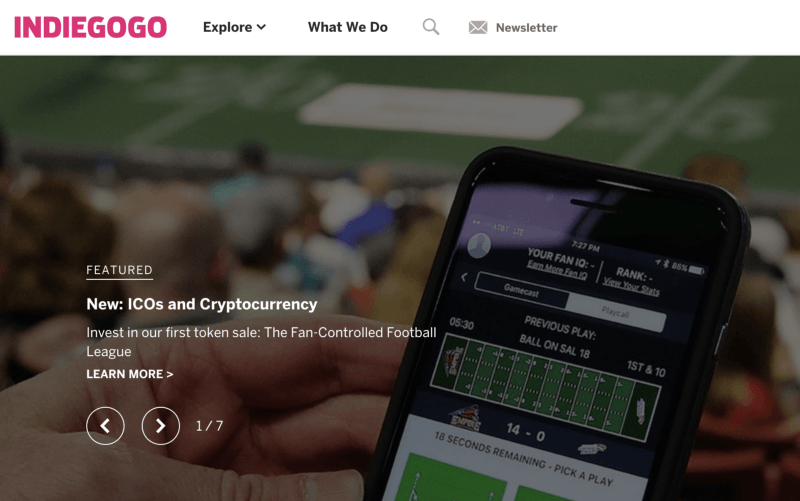 Not to be mistaken with yesterday’s security token offering for the rich, Indiegogo announced plans to branch out into initial coin offerings (ICOs) in a statement last December. Given its success (and some failures) in the crowdraising sector, the expansion into token offerings seemed like a good fit. The guinea pig was the Fan Controlled Football League (FCPL), an Indiegogo alum seeking to raise up to $5 million to build a community-run football league. In return, the company promised to distribute tokens to their investors. The token distribution was to be overseen by Indiegogo’s partner, MicroVentures. The announcement gathered tons of attention from media outlets, securing coverage from Fortune, CNBC, CoinDesk, TechCrunch, and even The New York Times.